eye-catching flow of sculptured light. 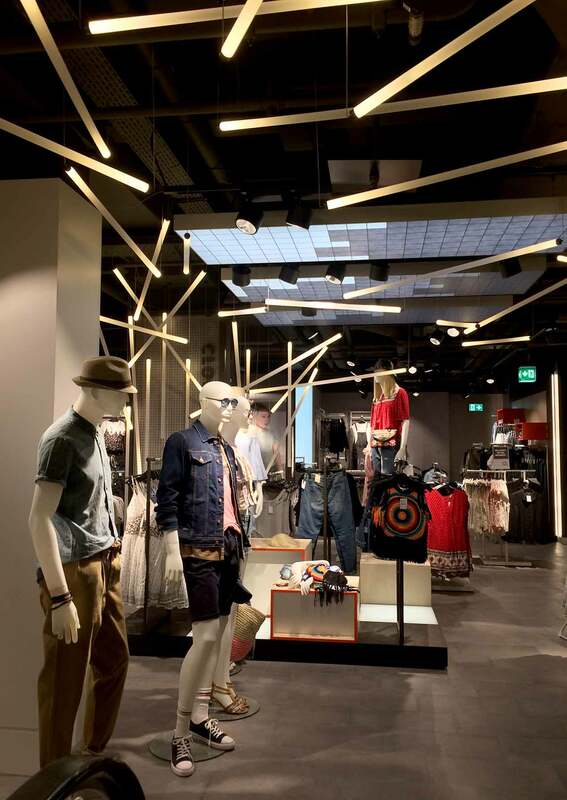 A dramatic and eye-catching light installation was required for C&A’s Clockhouse department in Bern, Switzerland. 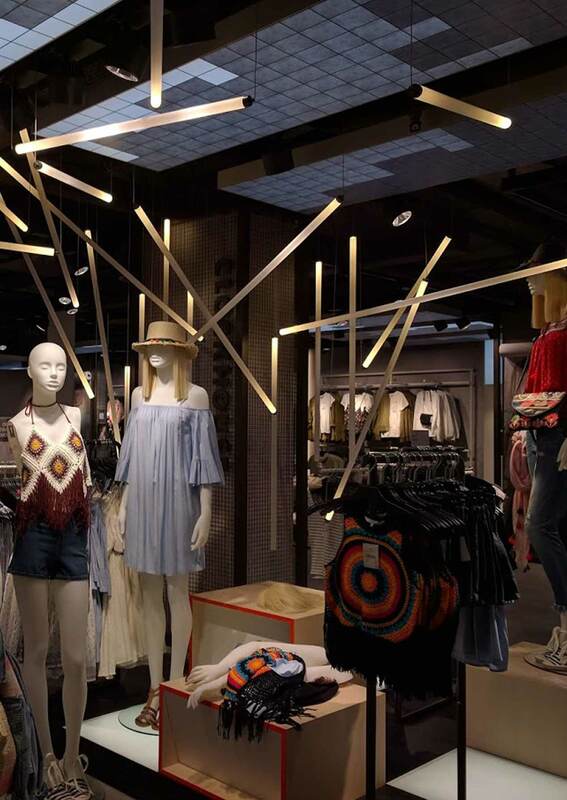 We were asked to design and manufacture a custom light sculpture that would flow from the street level entrance – which is separate to the rest of the store – down into the lower-ground shop floor. 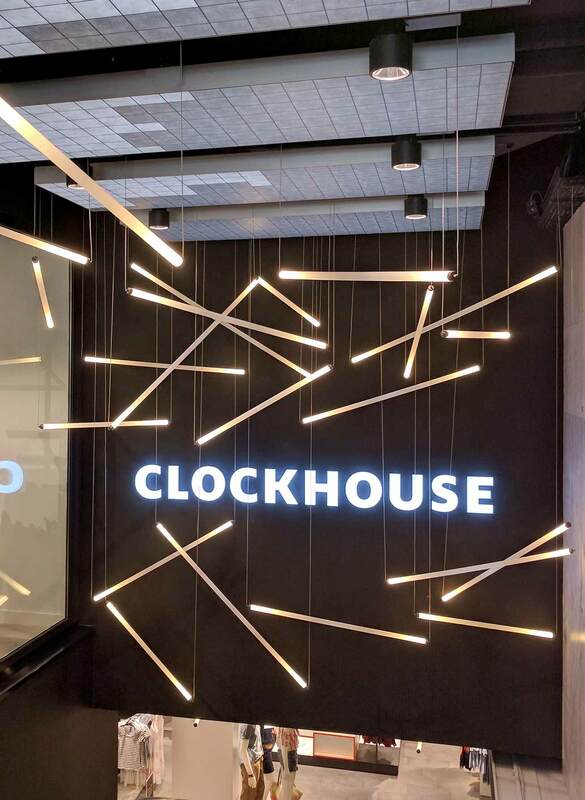 The installation had to work with the Clockhouse brand signage in the entrance, creating a “focus of attention” for passers-by. Below ground, it had to draw customers towards the main merchandising display and add to their overall shopping experience. The sweeping installation is made up of 86 suspended luminaires – in three different lengths – that hang over the entrance, cascading down the escalators and into the retail space. A heavily frosted finish was chosen for the cast acrylic rods because it has the ability to capture light beautifully. The flow of illumination purposely fades in the middle (achieved by the acrylic’s density and LED strength) of each fixture to create a soft, warm glow and add to the installation’s sculptural interest. An LED and lens, mounted on a custom board, are housed at each end of the fittings to punch light down the acrylic. Precision-machined aluminium end caps accommodate and heat sink the LEDs and were manufactured with special thumbscrews to clamp the coaxial cable. This particular cable was chosen because it does not detract (it’s fine and neat) from the installation, yet it still provides power and mechanical suspension – bespoke “invisible” plates mount the fittings to the exposed service trays, slab and ductwork. The installation was carefully orchestrated by the Nulty Bespoke team, with each luminaire being individually positioned, to create a striking and impactful piece of light art.